Patrick GIANI, the author of "Astrologie karmique : principes de base et pratique" (Ed. 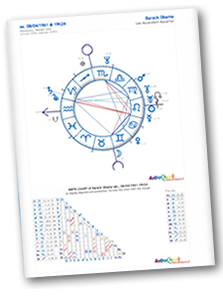 De Vecchi) helps you get a better knowledge of your Natal Chart with an additional interpretation of your karmic indexes (lunar nodes, dark moon, retrograde planets and part of fortune). It's a complete analysis of all the astrological elements in about thirty pages (sign, ascendant, planets, houses, aspects and astronomical indexes). Nota Bene : This karmic analysis does not claim to inquire about details of past lives ! starting from only 2657 JP ¥, including charts and interactive report !